Nathan Ligo is seated at the far left in this photo, Mas Oyama is at center. Judd Ried, next to Nathan, is one of only 2 foreigners to endure 1000 days in a program in which 120 before them had failed. Founder Nathan Ligo has been practicing Kyokushin Karate for 30 years, including two years spent in Japan (1990-1991) in a renowned residential program for the personal students of Mas Oyama (1923-1994) the creator of Kyukushin Karate. Nathan Ligo became one of only 3 non-Japanese students to be given a diploma, although Nathan’s was an honorary one, his having remained in the program for 600 of an intended 1000 days. At the time that he started the program at age 19, Mas Oyama cautioned his parents in a letter that from 120 non-Japanese to attempt the program for even shorter periods of time, none had been successful. Note the number on the certificate, #069, and Mas Oyama died the following year. That was how few of these were issued during Mas Oyama’s lifetime. Sensei Ligo’s first teacher, “Master” Seong Soo Choi, is the son of Mas Oyama’s eldest brother. Prior to his 2 years in Japan, Nathan was a student for 6 years of Mas Oyama’s nephew, Professor Seong Soo Choi, who was at that time a graduate student, studying Physics, at UNC. Early on in this time, “Master” Choi, encouraged the then teen-aged Nathan by telling him he would send him to Japan to train with his famous uncle if Nathan would only “follow his advice, do well in school, and become strong.” After returning from Japan and completing his college education at Davidson College, Nathan lived in trained in Korea for two years with the assistance of Master Choi. Nathan Ligo, center, in the Fetzer Gym (UNC) T-shirt, can be seen here at the age of 19 receiving daily instruction from Mas Oyama. Two photographs here are from the two years that Nathan lived and trained in Mas Oyama’s uchi deshi (residential student) program. At left, the 19 year old Nathan had only been in Japan for less than three months. Every morning that Nathan was in Japan for nearly 600 mornings Mas Oyama greeted his residential students at 9:30 am in this dojo “morning ceremony” in which Mas Oyama would lecture his students sometimes for a few minutes, but sometimes all the way until the first dojo training of the day started at 10:00. The uchi deshi had a private lesson with Mas Oyama every Thursday (see the first picture on this page which was taken at the end of an uchi deshi training), general training with Mas Oyama every Saturday, and once Nathan was attending special brown/black belt training, two additional trainings per week with Mas Oyama. Additionally Mas Oyama ate dinner with his personal students in the dormitory every Saturday night, and read and initialed their journal entries every day. 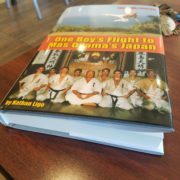 Nathan was the first and only residential student of Mas Oyama’s from a foreign country who wrote a formal journal in Japanese for the entire time that he was in Japan. In was reported that Mas Oyama had 12 million students in his organization at that time in 133 countries, and to be one of the few students (less than a dozen) who had daily instruction and interaction with Mas Oyama was a great honor. 19 year old Nathan Ligo fighting with Japan champion, Masuda Akira in 1990. Here, a 20 year old, brown belt Nathan Ligo can be seen fighting with the Japan champion, Masuda Akiria, as his 7th 90 second fight from 100 consecutive 90 second fights that the champion fought that day. Nathan lost this fight (you can see the video clip at right) and Masuda fought 100 consecutive fights that day! Nevertheless, that was the 30-something Japan champion at the time, and the 20 year old Nathan did his best, which is all that is ever expected in karate training. After three years back in college, 2 years training in Korea and two more in Hungary, Nathan spent several years back in North Carolina without a teacher before becoming a student of Kancho Hatsuo Royama, chairman of Kyokushin-kan Internatinoal in 2003. In the below photograph Nathan can be seen training with Kancho Royama in Capetown, South Africa when Nathan was there working as interpreter to support the seminar. Nathan Ligo in 2005 at a seminar in South Africa, practicing with Kancho (Chairman) Hatsuo Royama, one of Mas Oyama’s successors, and chairman of Kyokushin-Kan International Karate Organization. In the subsequent four photographs, 2 showing jumping ability, and 2 showing power, one can see the level of training to which Nathan Ligo has been accustomed at times in his life. The first picture below showing Nathan’s jumping ability was taken when he was 22 years old, the second one was ten years later. Nathan Ligo at 22, this photo taken at Davidson College. This photo was taken circa 2001 in Wollen Gym at UNC. Nathan Ligo breaking concrete with his unprotected shin. Breaking concete with seiken (forefist). In this case the last one didn’t break!